Morton County, ND – On the morning of Tuesday September 6, over a hundred Indigenous resisters arrived at a Dakota Access Pipeline construction site. This latest visit came on the heels of last Saturday’s confrontation, when private security forces used attack dogs from Ohio’s Frost Kennels to attempt to prevent members of different tribes from interfering with heavy equipment that was destroying the area’s sacred sites and ancient burial grounds. On Tuesday morning, construction workers left immediately as people began to enter the work site and an anti-pipeline convoy of dozens of vehicles arrived. Dozens of people quickly climbed on the bulldozers and other machines, and several people locked themselves to equipment using lockboxes made from PVC pipe. Unicorn Riot interviewed one of the water protectors as they locked down to the construction machinery (see below). 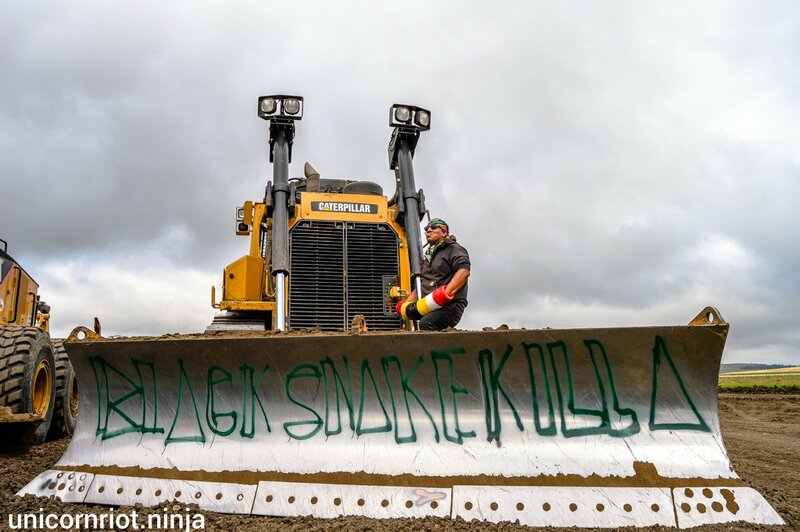 Numerous messages against the Dakota Access Pipeline, designs, and artistic expressions of Native spirituality were applied onto construction machines using spray paint. Green Party presidential candidate Jill Stein and her running mate Ajamu Baraka were among those who took part in the redecoration of the equipment. Deputies from the Morton County Sheriff’s office and officers from the North Dakota Highway Patrol were present, but generally kept their distance. Men suspected to be private security mercenaries were seen observing the actions on the site from up the road. Some participants in the day’s actions speculated that the sheriff had told the mercenaries to stay off-site during any protests in an attempt to avoid an escalated public conflict like last Saturday when the attack dog handlers loosed their canines onto pipeline resisters. The crowd of Indigenous water protectors remained at the site until the end of the work day, when those who had locked down to equipment unlocked themselves and dispersed with everyone else. Unicorn Riot is not aware of any arrests on Tuesday, although Morton County Sheriff Kyle Kirchmeier has said his office is “working up the information through the state’s attorney’s office to pursue charges (against Stein)” according to the Bismarck Tribune. This afternoon in an emergency hearing in a federal courtroom in Washington DC, Judge James Boasberg issued a temporary restraining order that halts some, but not all, construction work being carried out by Energy Transfer Partners to build the Dakota Access Pipeline. The temporary restraining order expires at midnight this Friday, September 9th, and Judge Boasberg said he will issue a ruling in the case on Friday. Further research into the organizations invested in Dakota Access Pipeline has been released. Food & Water Watch researched the numerous investment banks, oil companies and corporate entities putting resources into the project. Investment data at Morningstar also shows the precise shareholdings and bond holdings in Energy Transfer Partners LP as of the end of June 2016, and Stockzoa provides similar data. Government-backed public sector pension funds form an important pillar of fossil fuel project finance in the US, including the Dakota Access Pipeline. The Commonwealth of Pennsylvania has nearly 5 million shares worth $192 million invested in ETP, mainly via Pennsylvania Public Schools Retirement System. Sunoco Logistics Partners also based in Pennsylvania is another major investor. Research on this network has alerted many activists that there many political pressure points at which they could force divestment from this project. For a recap of the Sacred Stone encampment see below. August 31st, a Non-Violent Direct Action Stops DAPL Construction for Over 6 Hours.